Using catchy or attractive phrases to promote atheism is an interesting way to make more people understand the accurate meaning of being an atheist. This feat can be accomplished by designing, selling and popularizing the use of apparels that incorporate motifs, symbols and quotes related to atheism. This way, the t-shirts can serve as an informative, fun and non-confrontational way to educate those who know little to nothing about atheism. Incorporating commonly used phrases or coining new ones that have a catchy ring to them is a great way of using atheist quotes on t-shirts. Such quotes will not only help atheists share accurate information with those who are curious but also allow them come across as fun and relaxed people. The reason why religious adverts fail to impact people is because they often negate the fun aspect of a particular faith and seem to preachy in the process. Contrary to religion, atheism is actually a much light-hearted subject that happens to amuse even the gravest of atheists from time to time. 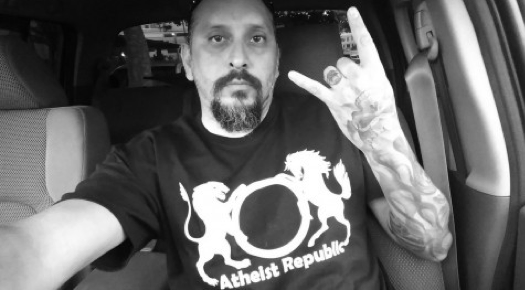 That is why, Atheist Republic’s t-shirts aim to cater to different kinds of people – from those who take atheism very seriously to those who cannot help but crack jokes about atheism in jest. If you think about it, the more we can explain atheism through our t-shirts or induce curiosity among those who know little, the more likely it is that people will grow more comfortable with the concept and seek more information about it. Atheist quotes on t-shirts are a particularly inoffensive and unobtrusive way of getting the message across to people who do not understand atheism. As you can see, the quotes are rather concise and to the point while still appearing reasonably edgy. We believe our t-shirts carrying atheist quotes will help non-believers put across a simple message firmly, urging more people to look upon the vast subject more favourably and perhaps adhering by it too, some day. So buy yourself a t-shirt and show the world that you support atheism.